Working toward a more positive body image is tough stuff. It feels like an uphill battle for most people, and is usually THE THING that moves clients back into a diet mentality, causing them to lose sight of the body trust they have been working so hard to create. You should know that recovering from disordered eating or cultivating a more positive body image isn’t linear. There will be ups and downs, and embracing that fact may decrease the emotional distress which often occurs when we expect different. The cultural pressures we feel about appearance are real. They are subtle and sneaky and can create shameful feelings about our bodies without us even realizing it. To deal with that shame, we make our bodies projects. We apologize for them, manipulate them, deprive them and beat them up at the gym. The answer for negative body image will never be found in changing your body. If it changes as a result of shameful feelings and actions, it will feel empty and hollow and you’ll go your whole life searching for the moment when you are finally happy and content. The answer is much less lucrative and way less popular: acceptance, respect and connection with your body just the way it is. I’ve blogged before about some tried and true ways to improve body image: gratitude, perspective, a social media detox, assessing whether it’s kind, necessary or true, and reevaluating what body positivity even is (spoiler: it has nothing to do with how you look!). Today I’m going to get personal and share the thing that had the biggest impact for me. I do so in case it will be useful for you too. First, it may be helpful to realize that diet culture prioritizes numbers and weight over healthy behaviors and well-being. On the other hand, a non-diet, weight-neutral approach is one that prioritizes healthy behaviors and overall well-being above numbers and weight. That’s a huge paradigm shift; it was for me and for most of those I work with. But it really resonated with me – I did not feel well prioritizing appearance over everything else. Embracing that idea was exactly what I needed to stay true to myself. After all, I was the one living in my body and I wanted to feel at home in it. If someone had an issue with how it was changing as I worked toward recovery, they didn’t know how good it felt to finally feel well nourished. My brain was alert and attentive. I could feel my vitality coming back and my body getting stronger. I could eat with my family again. I could travel without anxiety. Not everyday was a winner, but overall I knew that prioritizing my well-being was giving me my life back. I started feeling like myself again, mostly because I had the energy to engage in what I found meaningful. It was then I realized how much of myself I had lost to food rules and body preoccupation. That mantra was what got me through the tough days. 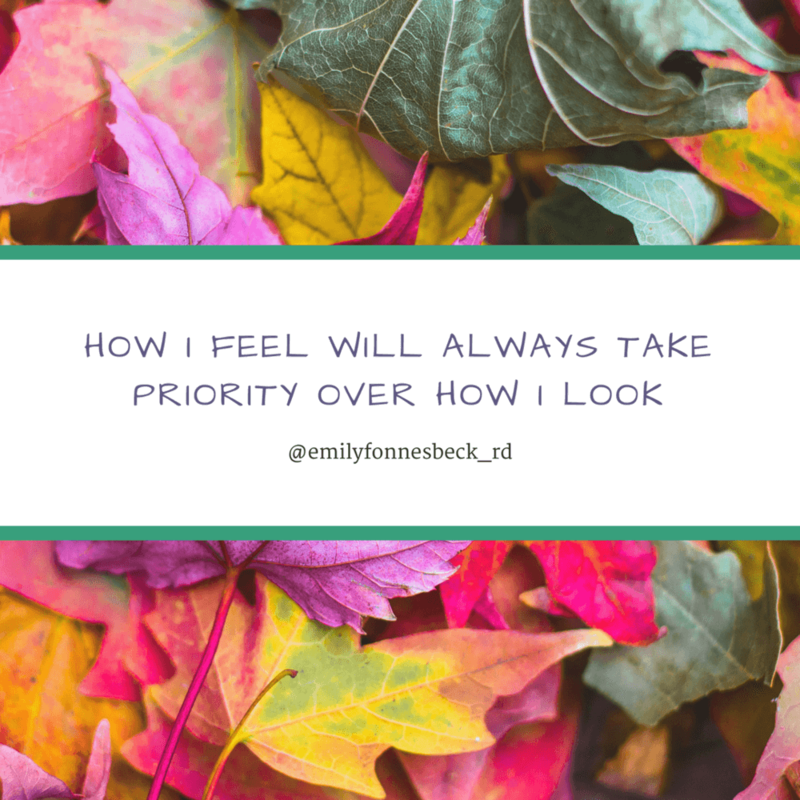 When I would feel triggered into feeling like my body was wrong and bad, it would help me remember my priorities. When the ED voice tried to convince me that my appearance was most important, I would remember how much happier and freer I felt without food rules and with body trust. Experiencing improvements in my physical and mental wellness were constant reminders that I didn’t want to go back. Essentially, I began to see my body as a vehicle for living a meaningful life. It’s not who I am, it doesn’t define me but it does enable me to live, learn, dream, achieve, feel and experience. As I said, I began to feel better mentally and physically but also emotionally and spiritually because I could finally FEEL more than just discontentment for my body. My body became meaningful for me, it wasn’t just an object to be picked apart. It all started with embracing health and well-being over appearance. My body had to be able to do what it needed to do without me micromanaging it. Instead I chose to listen to and respect it and that made all the difference. So if it’s helpful, perhaps think about how you could prioritize how you feel over how you look. I would love to hear how you plan to do that!